Mom's Gone Bronson! : FREE Microphone or Headset! HURRY! While Stocks Last! FREE Microphone or Headset! HURRY! While Stocks Last! Once registered, scroll down and you'll see a selection of various different head sets, microphones and combination headset/microphones to choose from and each customer can choose ONE totally FREE with FREE shipping! No credit card is required, no payment at all! 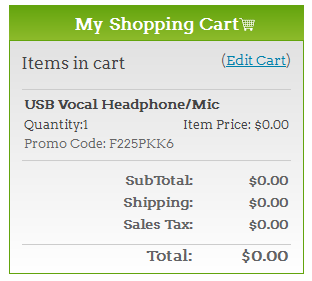 I chose the USB headphone/mic combination valued at almost $40!! What are you waiting for? Let me know if you get one! Disclaimer: I was not at all compensated for this post in any way, thank you!